According to Google, the fame of Vietnamese food has been increasing every year for the past decade, with total online searches since 2015 rising 11 per cent on a year-on-year basis. Vietnamese food is all about quality ingredients, used to create fresh and vibrant flavours. The food and recipes contain minimal dairy and oil, have complementary textures, and rely heavily on herbs and vegetables. 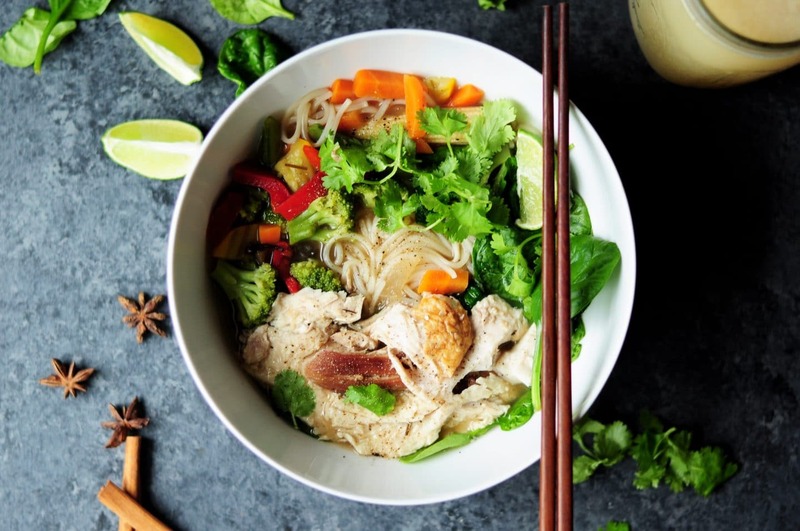 Vietnamese food has become so popular because it’s considered to be one of the healthiest cuisines around the world due to its low fat content and being gluten-free and packed with vitamins and minerals. Popular Vietnamese food includes ca-ri (curry), com tam rang (rice with fractured rice grains), pho xao (fried noodles), bun (rice noodles and pork with a dipping sauce) and goi (indigenous salad of Vietnam). One dish in particular that has introduced many people to the fresh and vibrant flavours of Vietnam is Pho (pronounced ‘fuh’). In its most basic form, a bowl of pho consists of a foundation of rice noodles topped with thinly sliced raw beef, which gets cooked when a portion of steaming, spiced beef broth is poured over top. The dish is finished with a flurry of fresh herbs, like coriander and basil, as well as crunchy bean sprouts, hot chilis, and tart lime. 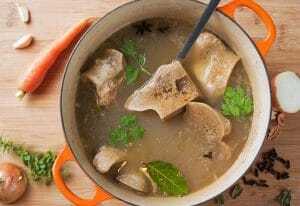 The main element to pho is the spiced beef broth, which to make you simply need to place beef bones, vegetables, vinegar, a bay leaf, peppercorns and garlic into a large soup pot and let it simmer on a low heat for between 12-24 hours. Once the broth has reached a dark, rich brown colour, remove from heat. Discard the bones, vegetables and bay leaf, strain the broth through a sieve or cheesecloth and simmer for a further 2 hours. 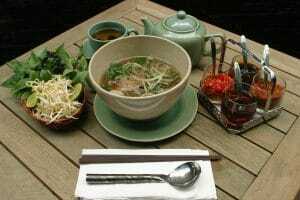 In the UK, Vietnamese food was helped made popular by casual dining restaurant Pho. The restaurant, which first opened in 2005, specialises in authentic Vietnamese food that is cooked fresh daily. 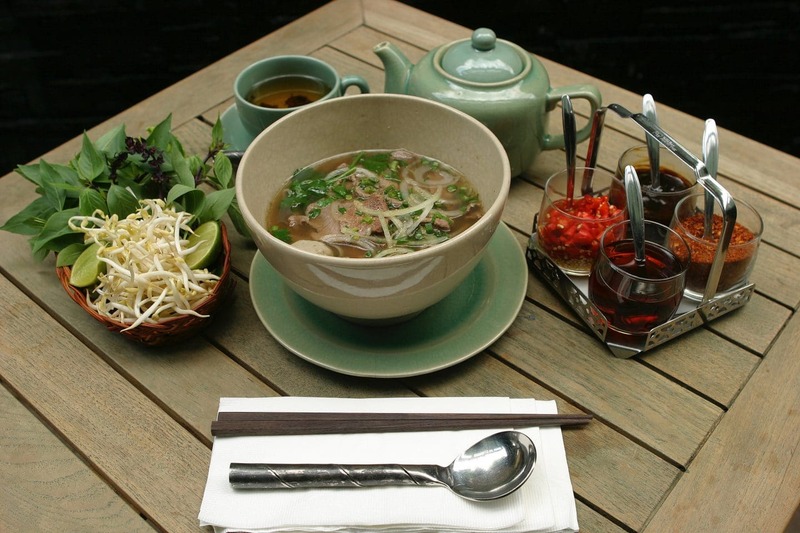 Currently Pho have 27 restaurants operating around the UK and they are set to open a further 6 by the end of the year. For customers looking to try Pho, these restaurants are also worth a visit: Café Mama Pho (Evelyn St, London), Union Viet Café (Union St, London), Minmin (Bromsgrove St, Birmingham) and Vietnam House Restaurant (Grove St, Edinburgh). Typically, dishes like pho are difficult to deliver to customers at home or to eat on-the-go due to their liquid base, however with the right food packaging choice, there is no reason why consumers can’t enjoy a warm bowl of pho in the comfort of their own home or on their travels. Here at Bunzl Catering Supplies we have a great range of packaging options to suit a wide variety of dishes on-the-go – including dishes which are served piping hot and have liquid content, like pho. One food packaging choice that is great for serving dishes like Pho is the Kraft Food Containers and Lids from our supplier KeCo. The containers and lids provide foodservice operators with a contemporary serving solution for consumers wanting to eat on-the-go. They are coated with PP, which makes them perfect for liquid-based dishes, suitable for microwave use and heated cabinet displays, and are available in 3 sizes; 8oz, 12oz and 16oz. 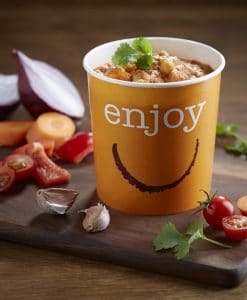 Another food packaging choice is the Eatwell paper food containers from our supplier Huhtamaki, which help caterers serve hearty and wholesome meals to be enjoyed on-the-go. The Eatwell range is available in plain white, the popular and colourful ‘Enjoy’ range or bespoke printed with your own branding. Eatwell containers come as combi-packs (containers and lids in one case) in 7 sizes – from 7oz to 24oz. For serving up a steaming pho we recommend using the 24oz size. 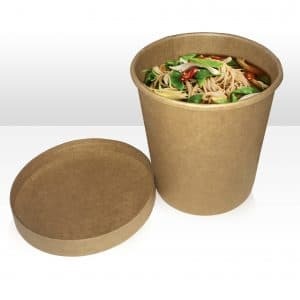 To find out more about our pho packaging options, please take a look at our disposables e-brochure or contact Bunzl Catering Supplies today.